This production takes place in 14 Henrietta street, which is one of the more impressive venues for the Fringe Festival. The former home of Richard Viscount Molesworth, it was built in 1748 and has all the features you would expect from a once great Georgian building. This was one of the most prestigious streets in Dublin when it was built, but it has lost its glamor and was a tenement building during the 19oo’s. It featured in the Dublin Tenement Experience which ran last year, a recreation of what life was like during the lockout in Dublin. It was also used as a venue for a number of Anu’s 13 series, so it is a building that is fast becoming a regular venue for Fringe events and long may that continue. 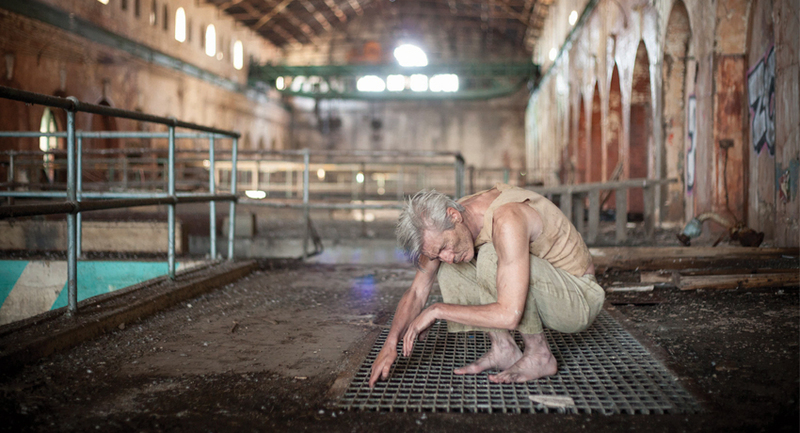 The bare wooden floors and peeling walls make this the perfect venue for a production of Beckett’s work concerning the degradation and isolation of old age. After waiting in the front room of 14 Henrietta street for a few moments, you are brought into another room by torch light. The room has its shutters pulled and is quite dark. You sit on wooden benches and wait for the production to begin. It is only as the light begins to rise that you realise you are not alone, and there is an actor lurking in the corner of the room, like a ghostly presence. The monologues are pre-recorded and played over the PA system, while the lone actor Richard Keane performs some of the activities discussed in the text. He slowly begins to move and shuffles across the room. There is impressive use of video projections, with images cast onto the walls of the rooms. Words from the text are projected, as well as full video images of the actor in other settings. Beckett’s original work Fizzles is a collection of eight short prose pieces, this production chooses three of them to bring to life. This is not typical Fringe material, and is a very slick and polished production. It is a charismatic piece that is closer to video/ performance art than a straight play. It delves into our collective psyche for haunting and stylized visions of old age and delivers some striking images. As ever with Beckett monologues, you have to clear your mind and concentrate on the text or else you’ll lose the flow. There is some work involved to enjoy this piece, but it is well worth the effort. Find out more about Company SJ here.